The flat, never-ending Dutch landscape seems to have had a pretty big affect on life in Holland. But funnily this applies to both people and animals! Whereas English farmland is divided by, now protected, hedgerows, the perfectly rectangular Dutch fields are neatly intersected by straight channels of water. I've realised, more recently, how these forms of drainage also are a really simple way of keeping farm animals in their fields. The animals obviously don't dare to cross these narrow stretches of water. 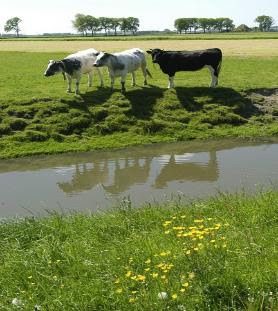 When looking across the Dutch fields from the point of view of a farm animal one sees a completely different view than from the English fields. If you were a cow living in England the only view out of your field would be through the gate, the rest of the field surrounded by either hedgerow or fence. For Dutch cows the only only place in which there is any type of physical barrier between your field and the one next door is the gate itself, until it's opened of course. This means that the cows and the sheep and the horses can all stare at each other and watch the world go by. The Dutch people also seem to be very comfortable with living their lives in full view of the outside world. The front of Dutch houses, old and new, generally have very large windows and people tend not to draw their curtains at night. This means that passers-by, or neighbours on the opposite side of the street, can stare into houses like goldfish bowls, or like cows in the field next door. 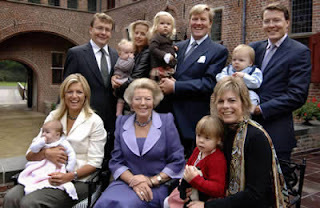 Perhaps all this explains why it was the Dutch that came up with the concept of the TV show Big Brother. Before I met my husband, all I knew about Holland was that it was responsible for some painful, and questionable, defeats over the English football team. The only living Dutch person I had heard of was Dennis Bergkamp, who I thought of as a penalty-box diving blonde cheat. If prompted, I would think of windmills, clogs and edam cheese. But I was completely incapable of distinquishing the Dutch language from German. I had read Anne Frank's diary at school and had some van Gogh's paintings as prints, but hadn't really realised that these two historical and cultural icons were Dutch. All said, I was completely ignorant of the who the Dutch were, their history or the rather sizable impact they have had, and still have on the world, despite their tiny population and percentage of the earth's surface. I think that most Dutch people, who tend to have great pride in their country and a huge amount of self-respect, would be very disappointed to know how little the rest of the world knows about their nation. I've learnt some interesting facts about the Netherlands in the last three years, but ashamedly I still haven't committed the Prime Minister's name to memory - all I know is that he looks like Harry Potter. And if after spending 27 years living in a neighbouring country this is how little I know, I'm sure I'm not the only one surprised to hear that the Dutch have a royal family and a colonial history as rich as the British Empire. Today I live in Amsterdam, and I have learnt more about the Dutch in the last three months than I did in my previous 27 years. Most of what I have observed has been unconciously, but immediately and directly compared to my life in England. The majority of this blog will inevitably be dedicated to these comparisons, and I welcome your thoughts and comments on my impressions as I recognise that my impressions are only one, very narrow, point of view.